Regular readers of The Goodman Chronicle already know that the future of transportation in Connecticut, if the tax free foundations get their way, is to revolve around increased restrictions on private motor vehicle use, and a focus on public transportation. Coincidentally (or not), some of the foundations advocating a reduction in private motor vehicle use in the state, were key coordinators for this meeting. These foundations include the Tri-State Transportation Campaign and the Regional Plan Association, both of which, as pointed out in previous articles, have received funding from the Rockefeller Brothers Fund, an organization advocating a much larger agenda, one aspect of which is the reduction of private motor vehicles. The forum opened up with a quick introduction by CT Governor Dan Malloy, discussing various aspects of the transportation situation in the state. 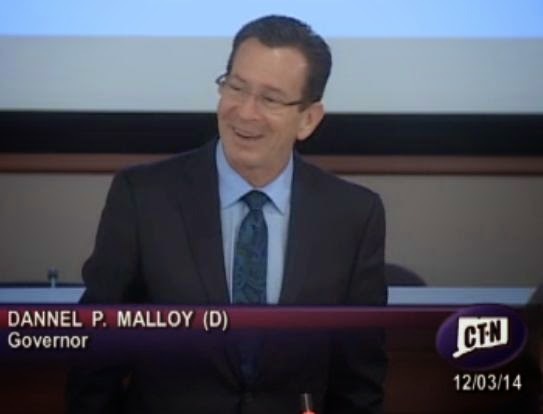 Along with public transportation goals, Malloy briefly mentions widening certain roads/highways in Connecticut in an effort to provide a better experience for private motor vehicle drivers. After Governor Malloy gives his four minute introduction speech, the topic of making transportation easier for private motor vehicle drivers is barely mentioned again, by any of the presenters, for the rest of the three hour forum. The focus of the entire forum becomes about designing communities around, and increasing the ridership of, public transportation. "We've actually not told people the true size and the cost of what needs to be done if CT is to be able to compete in the next 50 years." The key-note speaker for this forum was Robert Puentes of the Brookings Institution. Puentes discusses the increasing poverty in Connecticut, as well as the fact that people are driving less, and attributes these situations to the economic recession. The solution however, according to Puentes, is not to try to restore the old economy, with the same jobs, and have people driving again, but to "subscribe to a brand new growth model", and "restructure the economy" in a way that focuses on creating development, and jobs, around public transportation. The recommendations of Puentes favoring public transportation, not only ignores drivers of personal motor vehicles, but actually make it more difficult to own, and operate, a private motor vehicle. Like many of the "transportation advocates" in the state, Puentes' pro-public transportation advocacy is actually an anti-car philosophy. Some of these recommendations include a gas tax increase, toll roads, and more. Let us take a more in depth examination of some of the policies of this "brand new growth model" recommended by Puentes. Gas Tax Increase - While Puentes says that he doesn't see an increase in the gas tax being supported by the people, he does say that he thinks it "would help" finance future transportation projects. Later in the forum, Puentes, responding to a fellow panelists question about funding, is describing how some states are paying for this change in infrastructure, and development, and once again, mentions increasing the gas tax, except this time, bemoans his belief that "the gas tax hasn't been raised in a while" in Connecticut. This statement is very misleading. The state of Connecticut actually has two taxes on gasoline, the regular gas tax, which has been steady at 25 cents per gallon, and a gross receipt tax, which is continuously being raised, and in 2013 rose from 7.53 percent to 8.81 percent, which some analysts have called "the largest increase in state history". The gross receipt tax is a tax placed on the wholesale sellers of gasoline, and has a long controversial history in Connecticut. The supposed original intention of the law was just to tax the wholesale gas companies that sell to the retail gas stations, but of course, as anyone with a basic understanding of economics can understand, the retail seller of gasoline then passes this extra cost onto the consumers, thus raising the price of gas for the consumer. Also, according to TaxFoundation.org, Connecticut had the third highest state gasoline tax in all of the country, in 2014. Toll Roads / Congestion Pricing - Another scheme to generate more revenue to fund this restructuring of the economy, recommended by Puentes, is to add tolls to roads, and implement congestion pricing. Congestion Pricing is a system of surcharging users of public goods that are subject to congestion through excess demand such as higher peak charges. In relation to roads and highways, congestion pricing would mean there would be a higher charge to use the roads during busy hours, and less of a charge for less busy hours. Seeing as how Connecticut does not currently have any tolls on their roadways, this would be an obvious extra burden for owners of privately owned motor vehicles. Multi-State Partnerships - Puentes brings up another aspect of this "brand new growth model" that governments are using to generate revenue; multi-state partnerships. States are beginning to partner, and coordinate, on projects, in order to save money and generate revenue, "given the abscense of the federal government", according to Puentes. The idea seems to be that the Federal government, ever since the recession, has been incapable of continuing to fund this restructuring of the economy built around public transportation, therefore states are looking to coordinate with each other, on major projects, to lower the initial costs of these projects. Puentes mentions the West Coast Infrastructure Exchange as an example of a multi-state partnership that he particularly finds appealing. The West Coast Infrastructure Exchange is a partnership between the states of California, Oregon, Washington and the Canadian province of British Columbia. It should be noted that this partnership crosses not only state borders, but the country border. As described in the report, A Critical Analysis of Agenda 21 - United Nations Program of Action, regional governments, consisting of non-elected bureaucrats, superseding the authority of local, elected, governments, are to be the way of the future. Important to note, the West Coast Infrastructure Exchange is financed by grants from the Rockefeller Foundation. The connection between tax-free foundations, like the Rockefeller Foundation, regional governments, and the restructuring of the economy around public transportation, will be expanded upon later in this analysis. Land Value Capture - A tactic used by the state to take away more money from land owners, known as Land Value Capture, is also recommended by Puentes. The concept behind Land Value Capture is when the state feels that a public infrastructure project (highway, sewer facilities, etc.) adds value to your property, they then can begin taxing your property at a higher rate. Puentes says that where Connecticut builds transit stations, the state can "capture" the increase in value, from the private property owners around the transit stations. Public/Private Partnerships - In combination with most of these recommendations comes public/private partnerships. 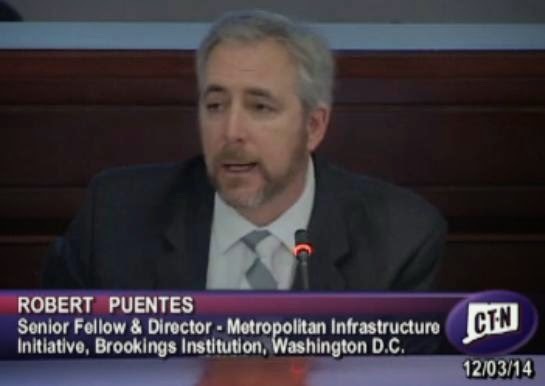 Puentes says that these partnerships are more than just selling off publicly funded assets to the private sector, and discusses how there are numerous private companies that are willing to "invest" in these infrastructure projects, however, as Puentes points out, they are obviously looking for a return and need to be paid back. Also on the panel of this forum was the CT Director of the Regional Plan Association (RPA), Amanda Kennedy. Before discussing the interactions between Kennedy and Puentes, it is important to briefly detail the influences of tax free foundations funding organizations like the RPA, in the state of Connecticut. A regular reader of The Goodman Chronicle.com will notice that nearly every analysis written, includes information on how a tax free foundation, or several, are involved with legislation, and/or, programs being advocated, and lobbied for. Some of the biggest foundations in the country are affecting changes in every part of our society, including transportation. The significant influence of these foundations, on our society, is not widely understand, though inquiries into this influence have been made, most notably a congressional investigation in the 1950's known as The Reece Committee. This investigation uncovered surprising information regarding the use of tax free foundations to fund organizations accused of "subversion", and the promotion of collectivist ideals, in the United States. For more information regarding the findings of this committee, I suggest reading the book Foundations: Their Power and Influence by Rene Wormser. Wormser was actually a part of the congressional committee commissioned to investigate the great tax-exempt foundations, and wrote "Foundations" to document some of the findings of the committee. A few foundations that were singled out in the Reece Committee hearings were the Ford Foundation, the Rockefeller Foundation, and the Rockefeller Brothers Fund. As will be evident, from just this analysis, these foundations are still very much active in influencing, and controlling, policy. Using the "Getting To Work" seminar as an example, both the Rockefeller Foundation, and the Ford Foundation, are significant contributors to the organization that Puentes is representing, the Brookings Institution, both donating over $1 million in 2014. As previously pointed out, Puentes was advocating a similar multi-state partnership to the West Coast Infrastructure Exchange, which is financed by grants from the Rockefeller Foundation. Coincidentally (or not) the Rockefeller Foundations and Ford Foundations are already funding multi-state partnerships involving Connecticut, such as the One Region Funders Group, which "is a partnership of private funders from Connecticut, New York, and New Jersey who are learning and working together to advance and support transportation planning and reform in the tri-state New York City region." The One Region Funders Group uses this support to fund other organizations, including two that were key coordinators for this forum, the Tri-State Transportation Campaign, and the Regional Plan Association. These two organizations have already been promoting many of the ideas suggested by Puentes of the Brookings Institution for years, in Connecticut, including the Tri-State Transportation Campaign advocating toll roads, and the Regional Plan Association coordinating multi-region partnerships. Many more interweaving connections can be made among this small group of influential organizations, who work together on many projects, and share similar goals, and understanding this influence will help put events like this "Getting To Work" seminar in proper perspective. Knowing that the Brookings Institution, and the Regional Plan Association, share similar financial influences, and objectives, it is interesting to watch the interaction between Robert Puentes, and Amanda Kennedy. For example, Kennedy asks Puentes what local transportation advocates in Connecticut can do to "move us into the next phase", and Puentes suggestions include areas that the RPA is already involved in, such as the promotion of complete streets, and bike sharing. Upon critical review and reflection, this forum appears to be more of a promotion of the system that is to be implemented than an open discussion about transportation in Connecticut. Throughout the meeting, the idea that people are driving less continued to be brought up, and even though Puentes quickly mentions one reason for this may be because of the economy, none of the panelists solutions involved lessening the financial burden to own and operate a private motor vehicle. Quite the contrary, as pointed out, many solutions suggested would increase the financial burden of owning and operating a private motor vehicle. One person that was on this panel, that deserves mention, is Doug Hausladen, director of Transportation, Traffic, and Parking, for the city of New Haven. 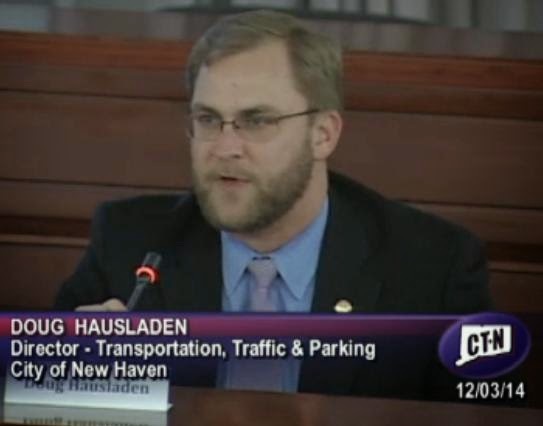 Hausladen discusses how the city of New Haven is changing their zoning laws, to reduce parking requirements. He also mentions a tactic used by the city of New Haven to reduce private motor vehicle usage, the implementation, and enforcement, of a complete streets program. As detailed in the article Agenda 21 in Connecticut: The Tri-State Transportation Campaign, complete streets programs are complete changes to road construction, and design, in order to remove the exclusivity of private motor vehicle use, and incorporate other forms of transportation, like bicycles and buses, into the process. In 2008, the previously mentioned Tri-State Transportation Campaign, along with a broad coalition, won passage of "complete streets" legislation in the city of New Haven. The enforcement aspect of the complete streets program is detailed in the design manual, where it states that police officers will be used to increase traffic tickets, which is just another tactic used to increase the financial burden of those with a private motor vehicle. "One thing that I always talk about is...how far people have to walk to get to a bus stop. The average transit user walks about 17 minutes per occasion of use, that times 2, for to and from work, is 34 minutes. That is over the daily recommended cardio excercise. So actually by being a transit rider, you have lower BMI, and you actually have lower rates of cardio vascular issues." The last detail of this forum that deserves mention is presenter Micheal Sanders of the CT Department of Transportation discussing the use of RFID chips. Sanders discusses how bus passes, for now, will use a magnetic stripe card, but the state is looking into using "smart cards", with an RFID chip. Sanders uses the city of Seattle as an example, where he says the RFID smart card has been integrated with various transportation systems, as well as embedded in the identification card for college students. This Getting To Work forum was just one of many presentations that have occurred across the state, put on by government agencies, in conjunction with private organizations, and non-profit foundations, in an effort to persuade the public that a future society of austerity, and limited mobility, is inevitable, and the solutions being presented as logical. Through analyses, such as this, it is hoped that more people will become interested in the seemingly innocuous events occurring throughout government, and critically examine the dubious connections of these policy makers and organizations.